a. 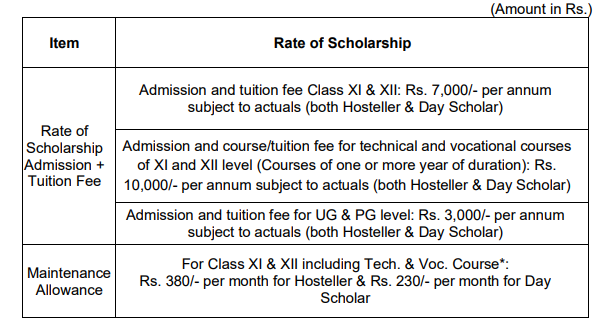 Fresh – As the number of scholarships for minorities available in a year is fixed and limited, it is necessary to lay down preference for selection. Inter-se selection weightage is to be given to poverty rather than marks (the applicant is required to submit an income certificate). In case of same income, merit shall be generated from ‘Date of Birth’ criteria of applicant (senior is preferred). b. Renewal – There is no merit list generation for renewal cases. Renewal applicant will get the scholarship if one has obtained 50% in his/her previous year’s examinations (at the same institute and in same course) and his/her application is verified by all authorities (as designated by Ministry of Minority Affairs) and approved by State Governments/ UTs.